Example of possible book cover for superhero novel. In past years, I used to be really excited about NaNoWriMo, the (inter)National Novel Writing Month. I would lay plans starting already in August, and on the last day of October – which some of us refer to as NaNoWriMo Eve or NaNoWe’en – I would restlessly visit the forums while waiting for the midnight hour to strike. Oh, and I took my vacation days in November instead of in summer. Not anymore. This year I kind of intended to participate, but after midnight I still did not have any good idea about what to write about. No, it is not like I don’t have ideas. I have more ideas than I can count. Ideas are like cats: If you take in two of them, soon your house is full of them. They are on your kitchen counter, they are on your couch, they are under your cupboard, they try to follow you into the bathroom. Actually, ideas usually succeed at this better than cats, but you get the point. There are always ideas, but none of them stood out as This Year’s Idea for NaNoWriMo. Around an hour after midnight, I picked one fairly pretentious one, a metaphysical fantasy about an unemployed warehouse workers which gets picked by the Universe to send to the Universe’s niece which was in a difficult age, with excessive magic production and wars and disasters. Insert deep teachings about the Great Chain of Being and the Descent of the Light into Creation. I wrote a bit less than 2000 words on it before I decided that this was way too serious a topic for speed writing. Also, not much fun. So the next day I started over with a fluffier story. Currently I’m writing about a gamer who tried to be a hero in Real Life and was stabbed and died. Or perhaps he didn’t exactly die. It is hard to know. What we know is that he wakes up inside his favorite superhero MMORPG, which was closed down the year before. Maybe this is his afterlife – he and the game are both dead – or perhaps he is in a coma and imagining all this. Or perhaps it is the future and his frozen brain has been scanned and uploaded to a supercomputer. Or perhaps he has been in a coma for many years and his actual brain has only now been connected to a supercomputer. Who knows? How are you supposed to find out from inside the game? If reality outside of reality was easy to find out, we wouldn’t have dozens of competing religions in the so-called real world, would we? But mostly it’s just the kind of fluffy feel-good superhero story with the occasional challenge thrown in, that I myself would like to read. It is almost certainly not going to sneakily save anyone’s soul while they let their guard down. So in the end, I am once again writing the kind of story I like to read. In fact, I am writing it because that is the only way I get to read it – the muses in my head won’t dictate a whole book to me if I can’t be bothered to write it down. That’s just how this thing works for me. So I guess I am, as you say in English, just pleasuring myself – in this case my mind rather than my flesh. But in either case, it is probably not something the rest of the world is particularly interested in. I may put it up with the old stories that are linked from my front page, in which case I will likely only post the first chapters as usual. We’ll see, nobody knows whether we will be here tomorrow. But if I am, chances are that I am writing. I do that pretty much every day, after all. Maybe they are right there, but will you find them? What if to everyone else they look like everyone else? This made me think about my current candidate for NaNoWriMo (National Novel Writing Month) this year, as I’ve mentioned in the previous entry. The main character and viewpoint character, a teenager who used to be an old man, now trapped in a world that used to be a game, is definitely searching for something. But I don’t really see him as searching for a way back home, not after the first pages at least. After all, in his own world he was ageing and with less than perfect health, no close family or friends nearby, no job and really no accomplishments to look forward to in the rest of his life. This was the world he loved, when he was not in it. It did not take long for me to realize what he truly is searching for. Alone in a world that used to be a game, he is surrounded by Non Player Characters – people who used to be just pixels and scripts run by a computer, but who now have real lives of sorts. But they are still Non Player Characters. They know nothing about Real Life and the world from which he came. As far as they know, their origin and purpose and the meaning of their life lies entirely within this world, and everything else would be like pure madness to them. In fact, that is exactly how they will react if he tries to broach the subject. And yet he must do so, because he is indeed searching. Not in the long run for a way back – that will come if it comes – but for others like himself. The one thing he cannot except is that he is the only one of his kind in this world, the only one for whom this world is not the ultimate reality. And it is not for him to find someone who says “OK, I believe you” even though that is hard enough. You’ve got to have been there. To share his memories before they are lost forever. Of course, this is just a work of fiction. But it is an interesting perspective, is it not? I wonder if I could manage to write it. I am perhaps the only one who get associations to “the other shore” from this Twinings ad. But that is not what I will write about today. A friend of mine luckily mentioned this advertisement from Twinings, and provided a handy link. This is a YouTube video, so it may not be suitable for all workplaces even though there is no objectionable content. But it has moving pictures. It has also a song, which in my opinion can be skipped without great loss. It is not inappropriate or ugly, but it does not resonate strongly enough with the animation to be crucial. For those who cannot see it, this is a short animated video with a slightly watercolor style, especially of the character. A young woman is rowing a small boat alone in the middle of a sea with high waves. She loses one oar and fails to catch it. The waves increase to frightening proportions that would by rights overturn or fill the boat, but strangely instead the waves and the storm conspire to push the boat ever more rapidly forward until it is flying on the top of the waves, and the storm-tossed foam takes the shape vaguely of seagulls flying overhead without losing its character as foam. As the boat lands again, the water rapidly becomes calm and the sky clears up, the boat continuing by its momentum toward a beautiful shore. At the shore someone is waiting. 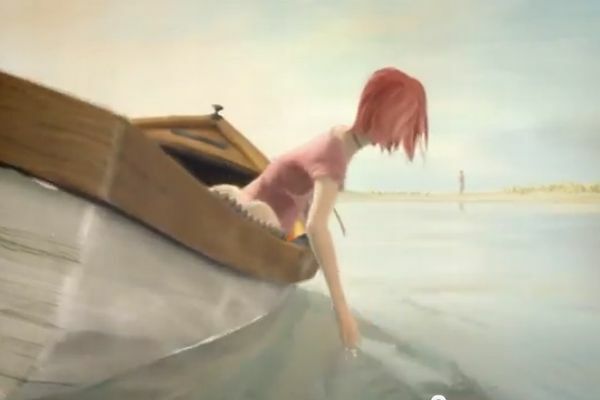 The young woman jumps out of the boat as it stops on the sandy bottom, and wades ashore there to meet her identical twin in a loving embrace. Then as the two line up side by side they seem to fade into one person drinking tea, and the message “Twinings gets you back to you”. In real life, I would say that under such adverse conditions it would take rather more than tea to bring us back to us. But that is not my message today, gentle reader. Rather, after watching the video clip a few times, I had my own inner vision (albeit dimly) of a potential story for this year’s NaNoWriMo, one appropriately symbolic while detached enough from reality to riff upon, as you say in English. The story would be about a young man who has a fateful encounter with himself – but not his current self. Rather, a godlike being (in the classical, idiomatic sense, not in the monotheist sense) who may be him from the future, or from an alternate timeline, or a higher reality, or two or more of the above. Basically, his ultimate potential. Over the last few years I have repeatedly begun writing about a young man meeting a woman from a higher reality – a goddess in the classical sense – who for some reason has decided to seek him out and live with him, although usually others cannot see her at all (and certainly not for who she is). This is basically the Jungian approach, since the Anima is usually the first experience of the numinous for a man, not counting religion as such. Rather, the goddess-complex is normally projected on some woman of his own generation, and it is with this projected ideal woman he falls in love, rather than with the actual person. In real life, amazing women are very rare (I have only really known one offline, outside my own clan) and goddesses are rarer than hen’s teeth. Being rather far from typical, at least now in my later years, I remember an amusing episode brought about by the voices in my head (which, need I remind you, are not actual hallucinations in my case, but rather streams of thought with some level of independence: People who are unfamiliar with introspection would probably assume they were thinking these thoughts themselves, which is in a certain sense true). The “voices” or muses can sing, however, and do so much of the time, enticing me to sing along. Conversely, they tend to sing along when I play songs I like. This also happened one day while I was listening to a love song by Chris de Burgh, for many years one of my absolute favorite artists (and composer and songwriter). The song was, appropriately, By My Side, from the album Power of Ten, the first album of his that I bought (although he had been active for a long time by then). But my voices took a slightly different route: They sang, without me by my side? In 2006, I “won” NaNoWriMo by writing a novel of more than 50 000 words in 30 days. Â Not exactly an amazing accomplishment, but still not something that just happens. I spent most of today reading it. Â It was not quite finished, although only the finishing scene is missing. I found it hilarious, especially for the first dozen chapters. Â The humor faded a bit over time, and there is a stretch of pure filler that needs a complete rewrite. Â But the verbal humor in the first half is fully comparable to some stuff I have paid good money for. Â Of course, I have the benefit of knowing my own sense of humor . Â Nobody has quite the same, probably, just like with fingerprints. The disturbing part is that I really doubt I could have done this now. Â Even three years ago, I had more humor and more sense of human interaction than I have today.